Convenience-store operators plan their stores so that when customers come in looking for a snack, they’ll have no trouble finding an array of chips, candy, sodas and other tasty treats. But when it comes to appealing to consumers who want a healthier snack, stocking shelves with better-for-you options can be a great way to increase sales. A July 2015 study from Brandware showed that 72% of consumers prefer to buy healthier snacks. Nowadays, shoppers have more options to choose from, including freshly prepared hummus and veggie cups, fruit cups and grab-and-go yogurt. Some consumers still think that c-stores don’t offer enough healthy snacks, though. To change the mindset that c-store don’t have enough options, retailers need to make these snacks highly visible in their stores—that can include placing them on endcaps or displays, where shoppers are more likely to notice them. In the realm of shelf-stable options that are convenient and easy to eat, snacks such as Popchips have been gaining traction. Touted as having all the flavor but half the fat of regular fried potato chips, Popchips are a nonfried chip that offers a familiar taste in a better-for-you package, which is perfect for snackers looking for healthy options. With an increase in snacking frequency, there’s also been a shift in what people are snacking on. According to Technomic’s 2016 Snacking Occasion Consumer Trend Report, powered by Ignite, 51% of consumers say healthfulness is very important to them when choosing a snack, and 40% of consumers say that in the last two years, they’ve been snacking on healthier foods more than they used to. When they reach for a snack at a c-store, consumers who want something healthier often choose fresh fruit, wellness/protein or granola bars, trail mix or jerky. Alongside these snacks, lower-calorie, lower-fat and more natural versions of snacks that consumers already love, such as chips and popcorn, are on the rise. The Technomic Snacking Occasion Report pointed out that highlighting the added nutritious aspects of snacks may drive sales of healthful snacks, so it can be key to sell products that call out benefits on the label. Additionally, the Brandware study showed that the healthy attributes most important to consumers included all natural, non-GMO and high protein. Retailers looking to increase sales of healthy snacks should stock items that fit that criteria. Other health benefits that can tip the scales for sales, according to Technomic’s 2016 Healthy Eating Consumer Trend Report, powered by Ignite, include natural and real. Fifty-three percent of consumers say that food and beverage described as natural is slightly or much tastier, and 49% say the same about food and beverage described as real. Retailers should stock shelves with snacks that offer benefits such as all-natural ingredients, no trans-fats, no artificial sweeteners or flavors and fewer calories than traditional snacks, as well as options that are non-GMO and high protein, in order to boost sales of healthy snacks. Retailers know they have what consumers want in the realm of indulgent snacks such as baked goods or chips, but for customers who want grab-and-go options that are convenient and delicious but not too indulgent, it’s important to stock alternatives. If consumers still think that c-stores don’t have the healthy snacks they’re looking for, they’ll go elsewhere—like their local supermarket—to purchase those snacks. C-stores can boost incremental sales by changing that mindset, which can be done through product promotion, including signage, and placement of healthy snacks in highly visible spaces within the store. 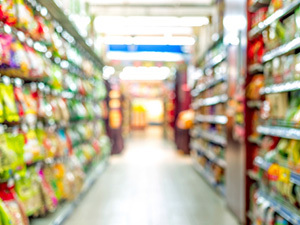 Once consumers see that they can get the same snacks at a c-store that they can at a grocery store, they may stop in to pick up a snack more frequently. Signage that promotes new, healthy items can boost engagement, as can marketing the new healthy snacks as a tasty, healthful alternative to products consumers already love.